Stemphylium macrosporoideum, the species included in the genus Stemphylium, was previously classified as Epochnium macrosporoideum. The identity of this species is treated as doubtful by some authorities . Stemphylium is a dematiaceous filamentous fungus that is widely distributed on decaying vegetation and in the soil. It is commonly considered as a contaminant. Pleospora is the telemorph of Stemphylium. The only well-known species included in the genus is Stemphylium macrosporoideum. See the summary of the active species and telemorphs for the genus Stemphylium. Stemphylium may cause phaeohyphomycosis in humans. Colonies of Stemphylium grow rapidly and mature in 5 days. At 25°C and on potato dextrose agar, they are velvety to cottony in texture. From the front, the color is gray, brown, or brownish-black. Reverse is black [1295, 2202]. Septate hyphae, conidiophores, and conidia are visualized. The hyphae are pale brown to brown in color. Conidiophores are dematiaceous and may be simple or branched. They bear a number of vesicular swellings or nodes. These nodular or knobby structures are more readily produced by aging. Conidiogenous cells are terminally located and percurrent (the proliferation which grows through the tip of the conidiogenous cell). Conidia (12-20 x 15-30 µm) are solitary, light brown to black in color, and rough- or smooth-walled. They are oblong or subspherical and rounded at the tips. 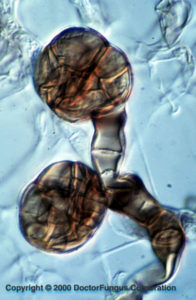 These conidia have transverse and vertical septations (=muriform conidia) and there is a typical constriction at the central septum. They are cicatrized (have thickened scars) at their base [1295, 2202]. 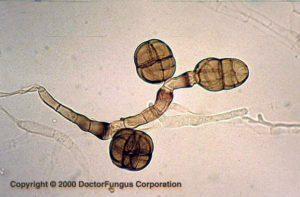 Stemphylium is differentiated from Pithomyces and Ulocladium by producing percurrent conidiophores. Very limited data are available. These data suggest that amphotericin B, ketoconazole, itraconazole, and voriconazole are active in vitro against Stemphylium strains . For MICs of various antifungal drugs for Stemphylium spp., see our N/A(L):susceptibility database.